A small group of 12 ramblers, including 3 visitors from the Biggar Ramblers group, assembled at the Cairnsmore Car Park near Palnure on a bright and blustery morning with the intention of climbing the Cairnsmore of Fleet via the Door. 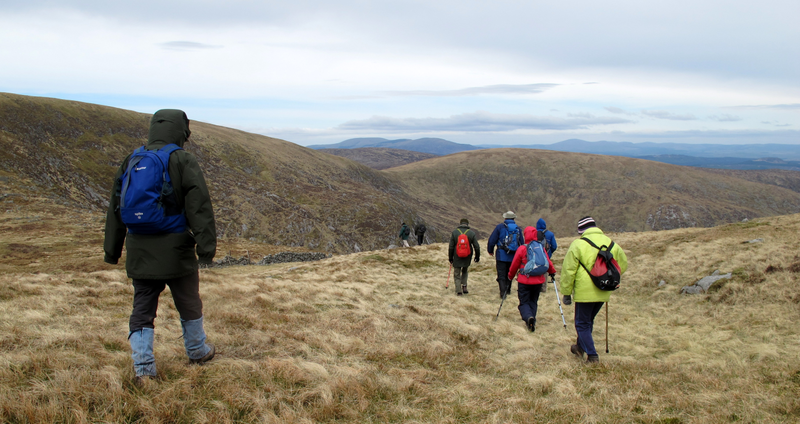 Cath, Thomas, Frances, Rachel and Alex met the other walkers at Palnure – Richard (leading), Mary, Leslie, Forbes and visiting Ramblers from Biggar – Pam, John and another, whose name I forget – for the start of quite a memorable walk! 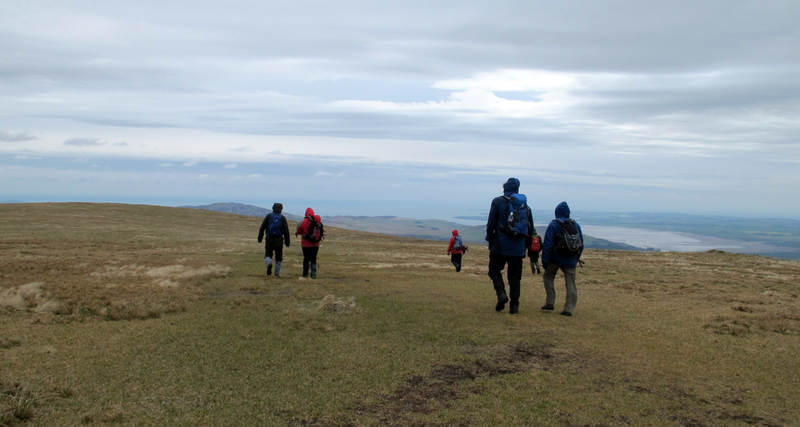 I enjoyed the company of our visitors who may often have wished that they had opted for the lesser challenge, by far, of the Isle of Whithorn to Garlieston which most of their group were doing today! They had climbed the Merrick on the previous day. 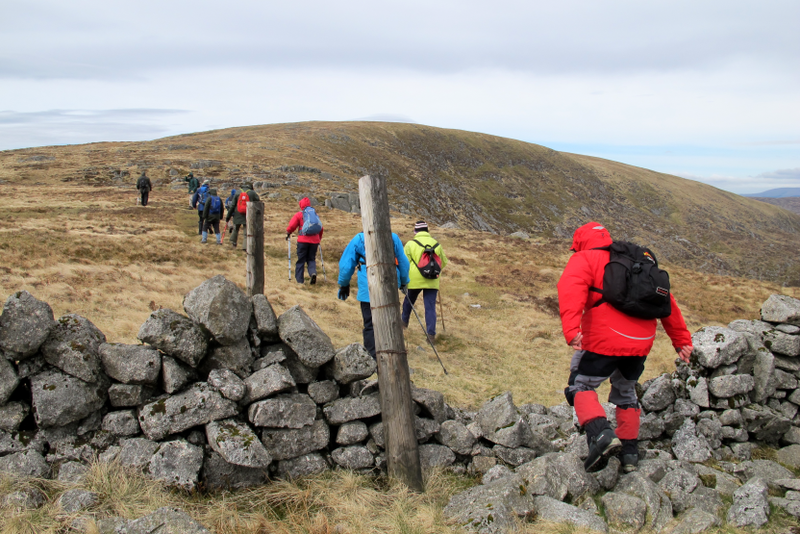 They set off up the track towards Cairnsmore House with the trees showing signs of spring growth and a few bluebells showing colour amongst the undergrowth. 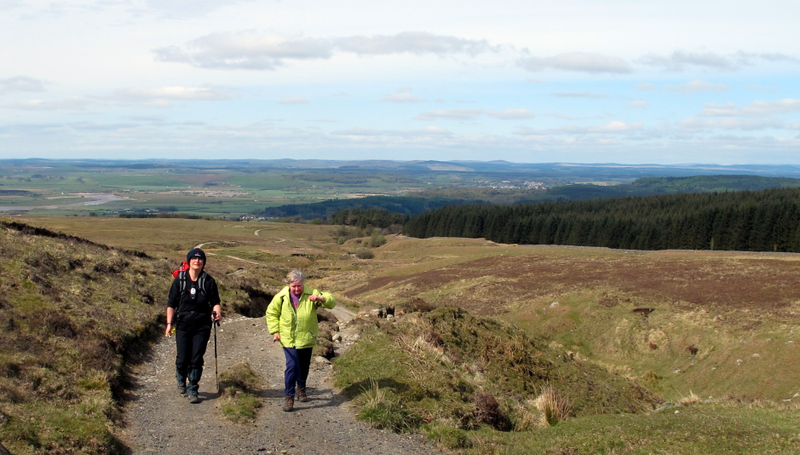 The route followed the traditional path until they reached the track at Cairnsmore farm. Here they turned right towards the keeper’s cottage and then took the track eastwards above the Graddoch Burn. The track continued to climb above the burn which it then crossed by a small stone bridge and emerged into an open field. Here the track was less well defined but the group followed the edge of the wood towards a gate which gave onto open moorland. A few lambs scampered after their mothers but otherwise the cold wind kept most wildlife hidden. On the moor the track was once again well defined. It had been a well made track with large boulders marking the edges and a cobbled infill but rain and farm traffic had reduced it to a stony scar across the moor. The group continued steadily upwards and soon reached the top of Knocktim Hill. 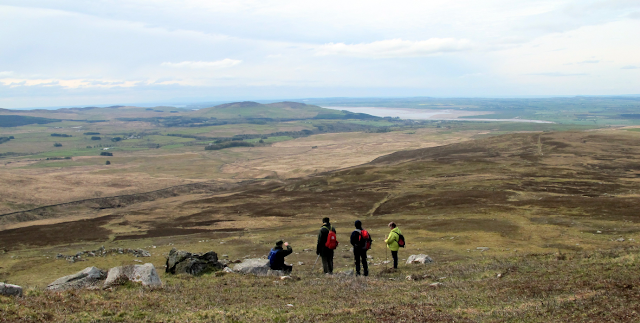 They paused to admire the view westwards over Wigtown Bay and the Machars. The Isle of Man and the Mull of Galloway were just visible in the haze. 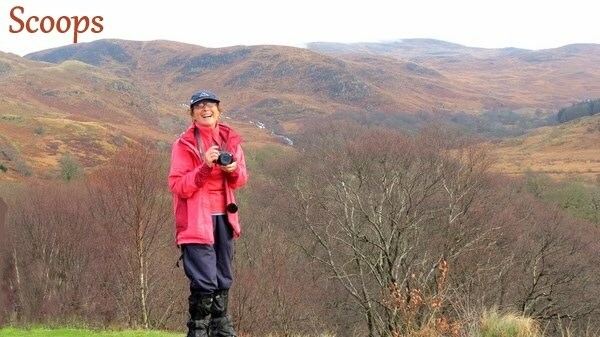 The cold easterly wind was funnelled through the gap between the hills and the walkers donned their coats and gloves and pressed on. Beyond Knocktim the track became wet and peaty for a short distance but the good stone track resumed as they approached the main hill. The map indicated that the track finished at a branch of the Culcronchie Burn but the ramblers found that it continued over the moor towards the Door of Cairnsmore. 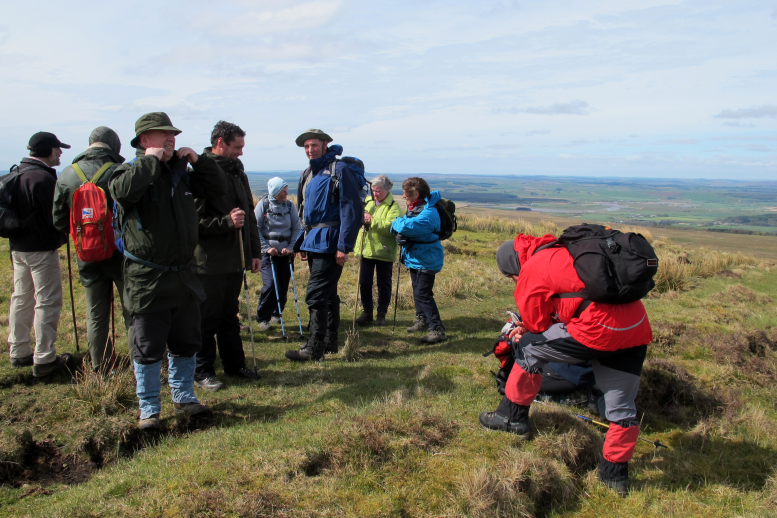 As the group approached the cliffs of the Door they turned from the track and started to tackle the main hill. They picked a route between the rocks and boggy patches trying to follow the areas of well burnt heather where the going was easier. 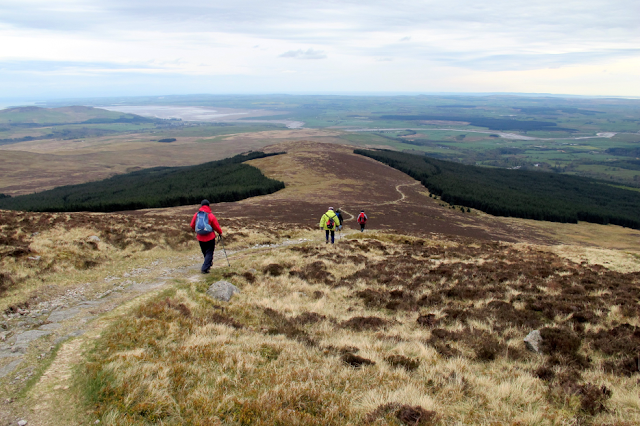 The route was sheltered from the cold wind by the hill above them and they climbed steadily, pausing frequently to admire the view and to get their breath back. Higher up the hill the slope eased off but the ferocious wind increased and threatened to blow them back down. I found the going reasonably easy until just before lunch when the wind was searing! Once the plateau was reached a short struggle against the wind led them to the cairn on the south summit of the Cairnsmore. They paused briefly to admire the view eastwards and then pressed on to find some shelter for lunch. They found a small hollow below some rocks and gratefully sat down to enjoy their meal. Lunch was a little late owing to the determination of reaching the right spot and I was really hungry, despite having some Jelly Babies earlier! Richard seemed quite content to stay in the hollow we had found but my feet were freezing and I could not even wander very far from the group when I crouched down for a private moment – Mary had gone further and got colder! After lunch they descended to the Nick of Clashneach where they crossed the old dyke and started to follow an old fence line above the cliffs. There were fine views of the Clints of the Spout cliffs on the east side of the Cairnsmore, once the home of eagles, and over the peat hags and forests towards Loch Grannoch. The dry weather meant that the Spout of the Clints waterfall was no more than a damp trickle down the rocks. The wind was particularly fierce and the group had to battle to maintain their balance. Some of the smaller members felt in danger of being blown away – no prizes for guessing to whom he referred! From there the views became even more photogenic and it was so frustrating having fingers which were too cold to function properly and the inability to stand up to take reasonable photos. I was amazed at how well the photos I DID manage to take actually turned out. I would have taken far more than the 88 I downloaded later today if it had not been so windy! 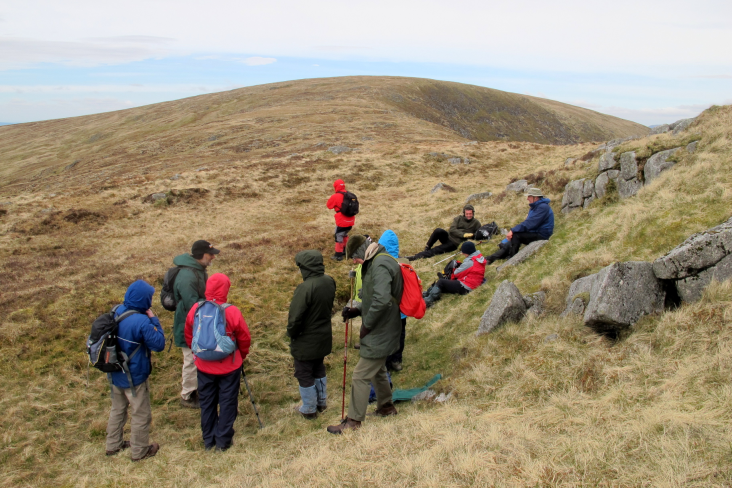 The group climbed steadily over the summit plateau and soon reached the shelter of the old cottage near the cairn. 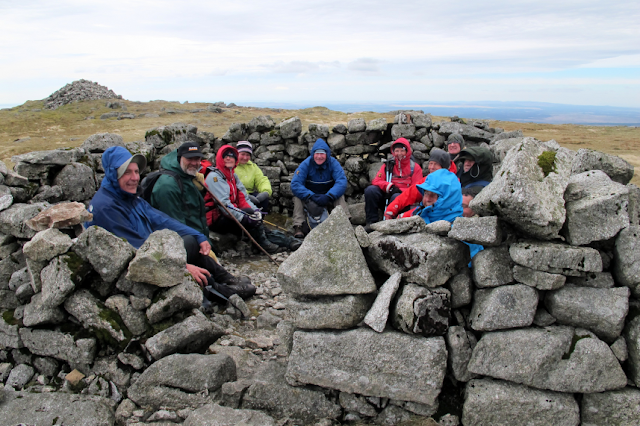 We plodded across the summit plateau with determination, eventually reaching the memorial to the airmen, the trig point and taking shelter for a short while in the remains of a cottage which I had always just thought of as a more recent construction built specifically for walkers’ temporary use! After a brief pause the group emerged into the wind again and, after pausing to examine the airmen’s memorial, set off down the traditional path back towards the car park. I did detour a few times as we went down, to avoid the joint jarring of the stony pathway but this became more difficult further down although, thankfully, the path became ‘softer’ through the woods. It was lovely to emerge from there onto open land and then to take the rhododendron lined path through a smaller wooded area, onto the road which took us back to our cars. As they descended they soon reached the welcome shelter of the trees and a steady descent took them back to the car. The day was concluded with excellent tea and cakes at the Stables tea room in Palnure.